Being a grown-up is hard and maybe not worth it? You might rather spend time tweaking your band`s set list until its guaranteed to get you that big gig opening for legit rockstars. Perhaps you`re better off dating someone a bit younger than chasing a fairytale romance with the age-appropriate girl (or boy) you met at a party. Maybe the drama constantly engulfing your pals feeds you, even if it`s bringing your friends down. And, don`t adults just sit at desks all day worrying about how bread makes you fat? Do adults ever even get attacked by random robot ruffians determined to pick a fight? 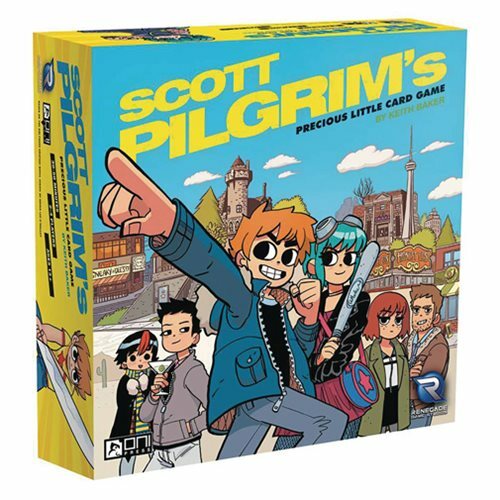 A deckbuilding game that challenges you to grow up and prepare for your finest hour, players in Scott Pilgrim`s Precious Little Card Game assume the roles of their favorite characters in the Scott Pilgrim universe, each with their own, unique starting deck. Innovative double-sided cards let you decide whether to solve your problems with hard work and empathy, or whether to embrace the unpredictable world of gratuitous video game violence. Ages 13 and up.